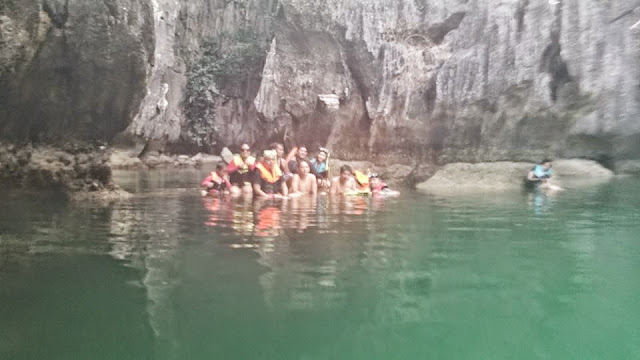 I was in awe to have seen several natural beauties in Palawan including a cruise towards the brackish (a mix of fresh and sea water) river at Sitio San Carlos, Brgy. Bacungan in Puerto Princesa City. The rest of our trip was spent in El Nido. El Nido is comprised of 45 islands and islets with lovely beaches and snorkeling as well as diving sites. We were lucky to have laid foot on some of the locations. Dilumacad Island was our first stop. It's only about 20 minutes away from the El Nido town proper or at least from where a majority of hotels, lodges, and other buildings for accommodations are located. It is more popularly known as Helicopter Island because it resembles a helicopter from afar. My husband thinks it looks like a whale instead. The island offers pristine waters where you can swim and an area for snorkeling. Be careful with the latter though because the section for snorkel enthusiasts have strong currents which will make it challenging to swim back on the shore. The Secret Beach at Matinloc Island is another wonder. Sadly, I wasn't able to bring any gadget to take photos from the place. So if this ever becomes part of your tour itinerary, make sure to bring water resistant cameras or simply protect your device with wet proof covers or an insulated gear bag. Hidden beach is worth the hassle to reach. Boats can only park at a safe distance so you would have to swim your way towards the corals and a narrow opening leading towards the beach. Slippers or aqua shoes can help protect your feet from rocks and corals. Every guest is required to wear life vests the moment you step on the rented boat so there's not much to worry about even if you can't swim. You can also always ask someone in your group to drag you towards the beach. :) I'm so ashamed I had to be ushered err.. pulled by the tour guide through a lifebuoy towards the beach. Talisay beach in Tapiutan Island is one of the usual stops for lunch due to the flat surface that's quite friendly to free soles; unlike other beach areas that are rock or coral clad, you can freely roam barefoot amidst this beach's waters. Head over for shade under the rocks to enjoy your meal. By the way, most tour packages include free lunch so there's no need to bring any unless you'd like to munch something between stops. This island was supposedly named after 7 lost commandos (Japanese soldiers) during World War 2. The white sand beach used to be an empty shoreline but there are now establishments in the area. Products sold are a bit expensive though like a mango shake (and other drinks) for Php 100 a glass. I would assume that the hotels and restaurants in the area are similarly more expensive than those present within El Nido's town proper. Big Lagoon is like a travel poster come to life. I can imagine the invitation as the boat enters the area and parades around the lagoon. Other than the unforgettable view of this place, there is a story we can pass on that relates to this lagoon. One of the guys in our group, Paolo, tipped the boat over when he tried to climb aboard through the bamboo on one side. Due to the sudden movement to the right, a newly opened Johnnie Walker Black Label bottle fell overboard. No one, not even Ron, a Navy officer who was with us, can reach the bottle from underneath the deep brackish waters. The hero of the day was our boat captain/cook/tour guide. He was able to retrieve poor ole Johnnie underneath the sea. There was a scarcity of tour guides during our second day's tour (it's labor day extended) so he took the role of a complete crew with just the help of another staff. There was a buildup of traffic at the entrance towards the Secret Lagoon. The boat can't proceed further anyway due to the presence of rocks and corals. But unlike the Hidden Beach, you can walk your way towards the narrow opening leading to the lagoon. Be careful with your steps though. Inside, the waters are actually muddy and murky. It's no place to swim. If you survived Small Lagoon, I say hats off to you! But if you're not in for the challenge, it's better to rent a kayak prior to the trip so you can paddle your way to the end of the lagoon in pairs without having to take the swimming challenge. If it cannot be helped, you are better off wearing protective clothing for this site such as a diving suit or long sleeved shirt with leggings along with aqua shoes and gloves to avoid cuts from sharp reefs. Matinloc Shrine is also located in Matinloc Island (along with the Secret Beach). Story has it, the shrine was built by a German-Filipino couple but was discontinued after they divorced. If any charity or religious organization took over the site, it's legacy would have continued as a religious retreat house. They can easily gain funds through fundraiser sites. There's a good view from the rock formations near the shrine (see image above). That's Mike Reyes, who work for a major TV company's media ads department. Shimizu is another flat surface beach like Talisay which is normally a tour stop for lunch or picnic. Some crazy lovely ladies were climbing the rocks in the photo below, can you imagine that? No wonder why one of them got hurt and asked us for band aid. Good thing I brought one. There are numerous other beaches and islands to visit in El Nido. But that's it for our post for now. We would definitely love to be back for other locations in El Nido as well as the rest of Palawan. For more information on what El Nido has to offer, see their official website.